Tania Marin, MSF Regional Medical Coordinator for Mexico and Honduras, explains the medical, psychological and social consequences of a sexual assault, the importance of talking about this topic with teenagers and the urgent need to eliminate cultural barriers, in order to reduce the long-term impact of the assault on their health. All MSF services are free and confidential. Why has MSF decided to focus its work on survivors of sexual violence in Mexico and Honduras? MSF is focusing its work on survivors of sexual violence due to the magnitude of the problem in the region. This has been under-reported in official statistics because most survivors don’t seek medical attention. There is also a gap between the public health sector and the third sector in the care given to survivors, which limits their access to care when it should be comprehensive. What does MSF’s work with survivors of sexual violence consist of? We have a Priority Service team made up of medical doctors, mental health professionals and social workers that can provide immediate care to women who have experienced sexual violence. The doctors can treat their physical injuries, and check for sexually transmitted infections, such as HIV, and unwanted pregnancies. The mental health team provides follow-up therapy to the survivor, and the social workers can answer any questions regarding the need of access, protection and any other need that could come out. The health promotion team provides information about sexual violence and its impact, and about how sexual violence manifests in the communities where we work. They also train hospital and health centre staff in Mexico and Honduras, and collaborate with local and national organisations to better coordinate the work and the attention given to survivors of sexual violence. In Honduras, MSF is part of a technical committee building a national protocol for emergency care to sexual violence victims. 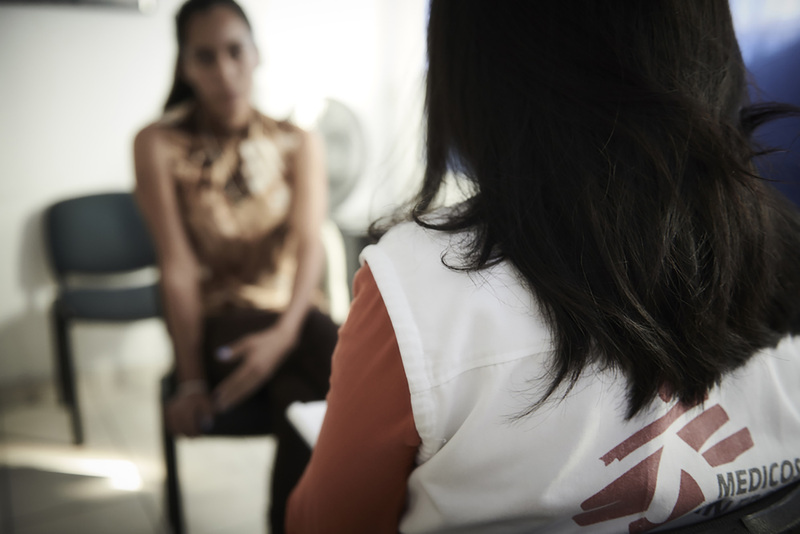 How many survivors of sexual violence did MSF support in Honduras and Reynosa, Mexico, during 2018? In 2018, we cared for 675 survivors of sexual violence in Honduras and Mexico. Unfortunately, due to the lack of information and the physical, social and cultural barriers the women face, most of our patients arrive more than 72 hours after the assault took place. Why is it important that they receive medical care in the first 72 hours after the assault? It is important because this is the window during which we can prevent unwanted pregnancies and sexually transmitted infections, such as HIV. It is also the period when they most need psychological care and social support. Why does MSF focus on the importance of receiving medical attention in time? There is an emergency care protocol for women who have survived sexual violence which includes the prevention of sexually transmitted infections. For example, if a patient doesn’t receive antiretroviral therapy in the first 72 hours, they could contract HIV. If they don’t receive the emergency contraceptive pill, they could have an unwanted pregnancy. It is important to mention that, even after the 72 hour window has passed, survivors should still seek medical and psychological treatment, including social services. MSF’s multidisciplinary teams also care for victims of other types of violence. What barriers do survivors encounter that prevent them from reaching MSF within the 72-hour window? In Mexican and Honduran society, sexual violence is stigmatised. We have seen a lot of sexual assaults where the aggressor was inside the victim’s homes. It is often a family member or a close friend. Then, the fact of mentioning that the aggressor is inside their house could be a limitation, because in a lot of times there exist an economical dependence or family problems. A further barrier is the mistaken believe that to receive medical attention, survivors must first make a police report. It is good to file a report, but it is not compulsory and the survivor of a sexual assault will receive comprehensive care either way. Which groups are most often victims of sexual violence? We know that we don’t see all the survivors of sexual violence because of the barriers I mentioned before. Most of those that MSF does see are women, but this does not necessarily mean that men do not also suffer from sexual violence. Due to gender stereotypes or mistaken ideas around masculinity, men usually don’t seek out care. Another under-reported group are underage men and women that are dependant from their parents or other carers, who may not believe them or treat them as if the attacks are their fault. Do you have cases of teenage pregnancy due to sexual assaults? In 2018, at our project in Tegucigalpa (the Honduran capital), nine percent of the patients that were pregnant when they arrived at the Priority Service. Of those cases, 90 percent told us that their pregnancy was due to a sexual assault, and 19 percent of those were under 18 years old. We know that a teenage pregnancy has a major risk of complications and the mother-child binomial is more vulnerable. However, this risk can be reduced if the women receive the emergency contraceptive pill in time. How do you work to reach young people? An important part of our work is disseminating sexual and reproductive health information and teaching about sexuality in schools. In Choloma, Honduras we run workshops in schools that explain, for example, what consent is, the different types of violence and other topics. We work with young people, teachers and parents. Now we are implementing the Friendly Services, a care model designed to give teenagers information and services related to sexual and reproductive health in an independent way, when they ask for it. What are the challenges for this programme? The challenges are to be more open to the topic of sexual and reproductive health, and make the services more accessible. It could be just to deliver information or for the patients to receive medical and psychological care.